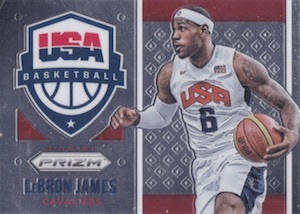 Although Prizm is now a familiar sight for basketball collectors, 2015-16 Panini Prizm Basketball tweaks the traditional formula a bit. In addition to one autograph per hobby box, collectors can also find 12 Prizm parallels, three of which are numbered. 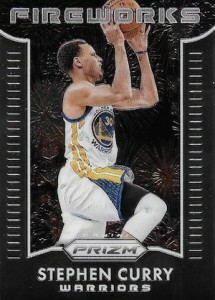 Offering one of the deepest base checklists each year, the full Prizm total includes 400 cards. Of course, a variety of Prizm parallels are also available, with options like Gold, Purple and hobby-exclusive Mojo. Certainly a key upgrade for Prizm, the 2015-16 release includes on-card Rookie Signatures for a checklist of more than 40 players. Hyper Prizm parallels are limited to just ten copies. Lastly, a handful of inserts focus on the top names in the league. Fireworks take a look at explosive players with a colorful design. Point Men covers the primary ball handlers using a horizontal design. Going the patriotic route, USA Basketball includes the players that lend their talents to the national team. UPDATE: Like they did for their football release, Panini has announced that exclusive White Sparkle Prizm parallels can be obtained in three-card packs from the Panini Rewards site in exchange for 1,000 rewards points. The promotion is limited to three packs per household/account and begins at noon CST on January 18, 2016. The entire 300-card checklist is covered and each card is designated as a super short print (SSP). However, no specific print run amount or range was provided. 2015-16 Panini Spectra EMMANUEL MUDIAY BLUE PRIZM AUTO AUTOGRAPH JERSEY RC!! 400 cards. Shop for complete base sets on eBay. 13 cards. Serial numbered #/150 or as noted. Any idea what colors have been eliminated from last year when they had 17 parallels? Shawnb � The number referenced (12) is the expected Prizm parallels per hobby box, not the total number of parallel options in the release. 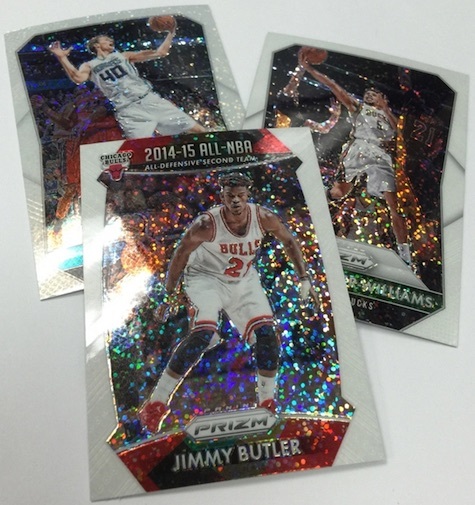 Panini has not disclosed how many colors are in the Prizm rainbow this year. Nice looking cards as usual and very solid players selection for the set. So no checklist? What is the hold up? Anyone know? Panini wants to unload as much of this stuff to their distributors and group breakers, prior to release, so they withhold it until probably mid afternoon today. It’s one of the more annoying things in the hobby. Not being a basketball fan, I took a chance on a Jumbo box. Glad I did. 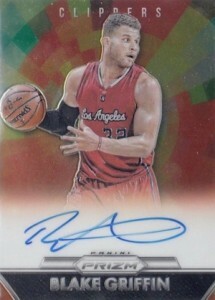 Blake Griffin Hyper Prizm Verteran Signature 8/10! But only two autographs vs. three in last year’s jumbos–not good. First off Chris, nice hit for not being a bball fan! Anyways, to my name….can his stuff get any hotter or more expensive for a rookie? I know he’s playing out of his mind(not every game) but I can’t remember a rookie since maybe lebron take off like he has. However all the people cashing in make this hobby a joke! Seeing people just put an obscene price on a non-auto card is degrading to what was a fun hobby! It is what it is but when base rookies are going(or asking) $30, it makes me scratch my head. 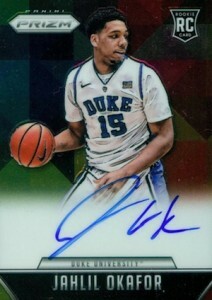 Anyways, opened some retail and pulled some okay cards….as usual with NBA Hoops rookies were the same in each blaster. Literally got the same rookies in each one..even in the prizm got two rookies and two rookie red white blues that were the same. Overall as an assessment of the product is nice! I happen to like the product; It’s an enjoyable break with an interesting assortment of parallels… and an admittedly irritating number of rookies who will be working the stockroom at COSTCO within a season or two. Porzingis… to your comment, although he was already a 2nd-3rd year player, Jeremy Lin saw his cards escalate both rapidly and unreasonably. His Auto rooks reached the sort of rare air reserved for the association’s royalty. Lin has come crashing back to Earth over the last 2 seasons, and his auto rc’s are no longer closing at between $700 and $1,500. HOWEVER, Porzingis is far more skilled and offers upside.. though how much upside remains in his over-priced issues remains to be seen. I rate a lot of products on this website and this is only I believe the 3rd product that I’ve given 5 stars. Some products manage to completely capture my attention and tap into the joy of collecting better than others. 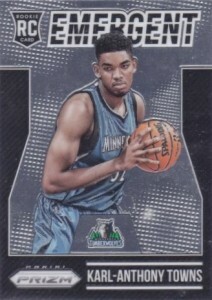 For me, 2015-16 Prizm is that type of product. First, the size of the base set (400 cards) in conjunction with the amount of base cards per box makes it a very fun set builder product. Completing a set with 1 or 2 boxes is nice, but there is no journey to that. 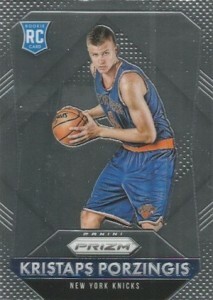 I have gotten about 10 boxes of Prizm Basketball and am about 3/4 of the way through the set. Also, trying to complete the rookie card portion of the base set (50 cards) is equally as challenging. For this reason, both the base set and rookie set sell for quite a bit more than most low/mid-end product base sets. Second, with 1 autograph card per hobby box and 2 per jumbo, there is enough big hit draw to keep it interesting, but not so much that the box price becomes unmanageable. 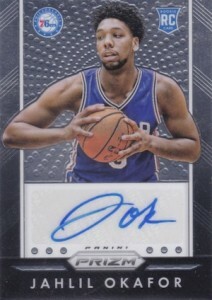 I’ve found the auto checklist to be relatively strong, having pulled autograph cards of Andrew Wiggins, Victor Oladipo, Ben McLemore, Willie Cauley-Stein and Emmanuel Mudiay. If you are a set builder and not in it for the autos, it is nice to have a decent chance at an auto with good resale value, to absorb some of the box price. Last but not least, the prizm parallel cards are what makes this product really fun. It’s the perfect proportion of serial numbered and non-serial numbered prizms per box, and they are really eye popping cards. There is nothing better than catching a glimpse of gold after opening a pack and waiting to find out which player you have, knowing you have one of only ten in the world of it. So the White Prizms you have listed as a parallel are completely different from the White Sparkle SSP cards? Hallco � Yes. The White can be pulled in normal packs and has a wave-ish Refractor design. 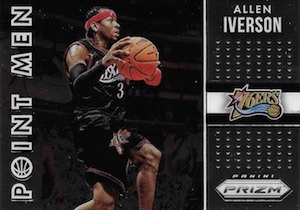 White Sparkle was issued direct from Panini in special packs. I may be an outlier but in a box that contains only 80 cards with a base set of 400, it’s absurd that I got 7 duplicates. Anyone else experience this?